It’s been incredibly hot and humid in Sydney all through January, but then we had a cool, rainy spell and on Saturday, it was one of those impeccably beautiful late summer days that serve to remind you that despite all the whinging and moaning about the heat and humidity, there are days like this when summer is just awesome. 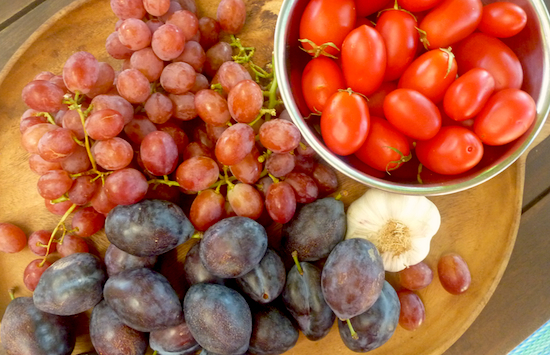 On Saturday morning, I went to Frank’s fruit market in Haberfield and had one of those brain explosions of inspiration from all the beautiful summer produce. A customer asked Frank if he had any cherries, ‘The cherries are over for this season’, he replied with an air of firm authority, implying a lesser fruit market might sell cherries past their prime, but not Frank’s. Then another customer, a Scottish guy, earnestly asked Frank if it was time to make his passata yet. ‘Not yet’, Frank said. ‘Give it another couple of weeks‘. Frank’s stocks the widest variety and best tomatoes in Sydney and it was good to know he was also the expert on the perfect time to make one’s homemade passata. I don’t know whether I’ll get round to actually making my own homemade passata this year but this sauce is a fantastically easy way of soaking up excess cherry tomatoes. When I use the small cherry tomatoes, I keep them whole but Frank’s had packs of the very small Roma tomatoes on special, so I bought some to make this sauce, and then cut them in half. 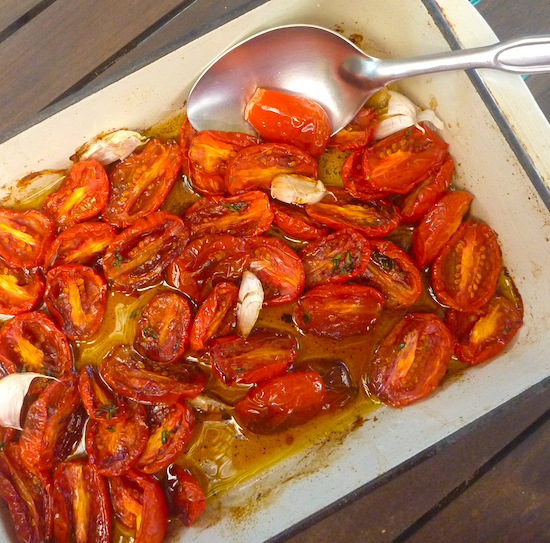 The slow roasting of the tomatoes gives the olive oil and Balsamic an intense, essence of summer tomato flavour. You can use this sauce on pasta, as a bruschetta topping with fresh ricotta, and it’s fabulous on pizza, but it’s also just perfectly delicious to dunk bread into it and eat it straight from the pan. In fact, once you start tearing off bits of bread to dunk and eat with the tomatoes, it becomes very difficult to stop. If you can wait, allow to cool after baking and serve at room temperature, so the flavours have time to settle and meld. Preheat oven to 160°C (325°F), 140°C fan forced. Whisk together oil, vinegar, sugar, salt and thyme. 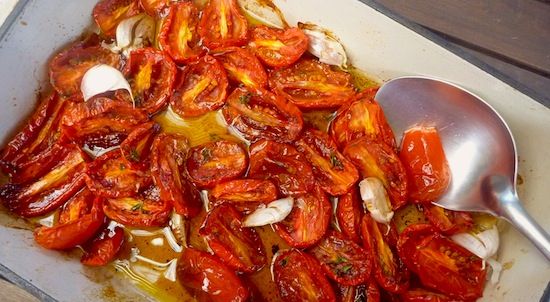 Wash cherry tomatoes and place in a single layer on a baking pan. Drizzle over olive oil mixture and bake in oven until soft, collapsed and caramelised (about 1 hour). Let cool in pan. Eat at room temperature. Sauce will keep for up to five days in the refrigerator. That sauce looks absolutely perfect. I’ll have to hit the markets this weekend and stock up so I can give it a try! Thanks for joining the linkup again! It’s so good, just after I made it my oven blew up so I’m relegated to stove to cooking for the rest of the week. When made with high quality ingredients, the simplest dishes can be the best. Looks delicious! Oh, they look gorgeous. Pass over some bread and I’d be very happy indeed.